Upon request I will line the stocking for an additional $10.00. NOW TAKING ORDERS FOR 2019 RESERVE NOW, YOU WILL NOT NEED TO PAY UNTIL I START ON THEM. 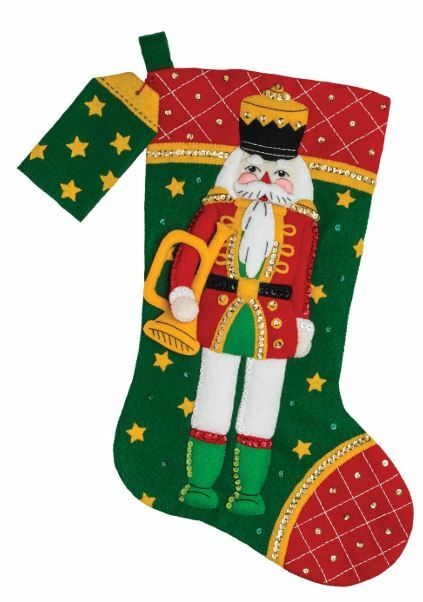 SO RESERVE EARLY TO GET THE ONE YOU WANT. 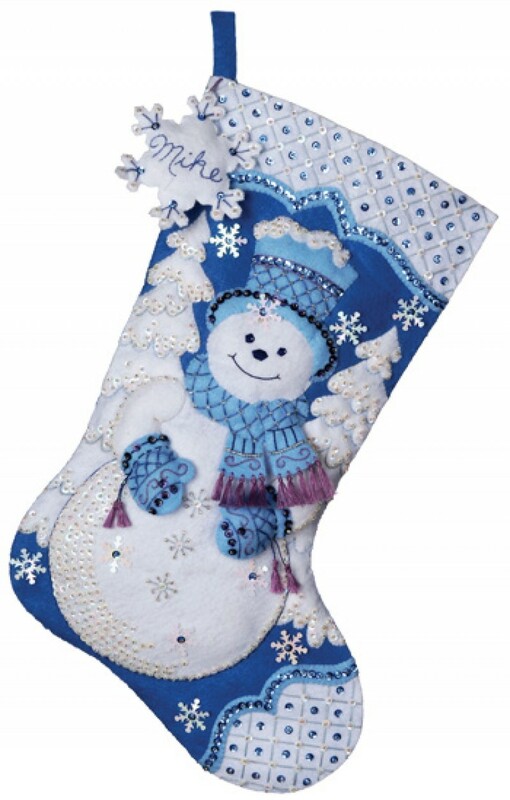 "SPARKLE SNOWFLAKE" - $135.00 - Glittering icicles dripping with lots of shinny sequins hangs down the top of a dark blue stocking covered in a variety of light blue and white snowflakes. You will also receive a matching ornament of a blue and white snowflake to hang on your tree. "COWBOY SANTA " - $140.00 Yeehaw! 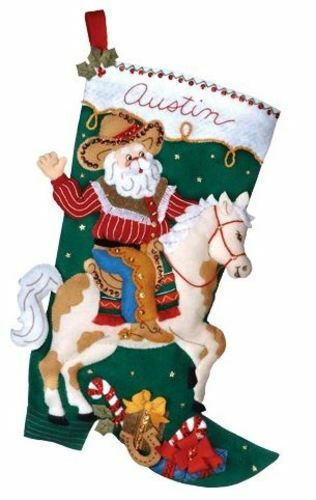 Santa is riding his trusty horse in this boot shaped stocking. 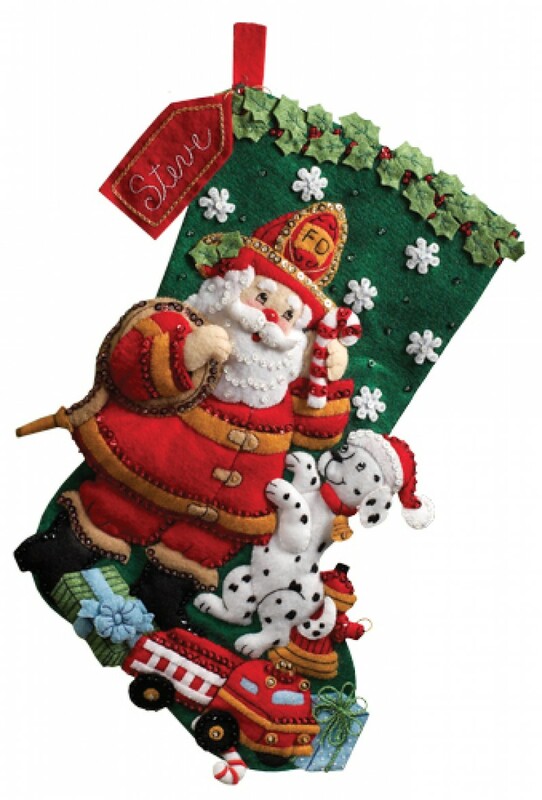 "SANTA'S VISIT " - $135.00 - Santa appears to be filling this house with lots of gift as the little dog at his feet watches him do his work. 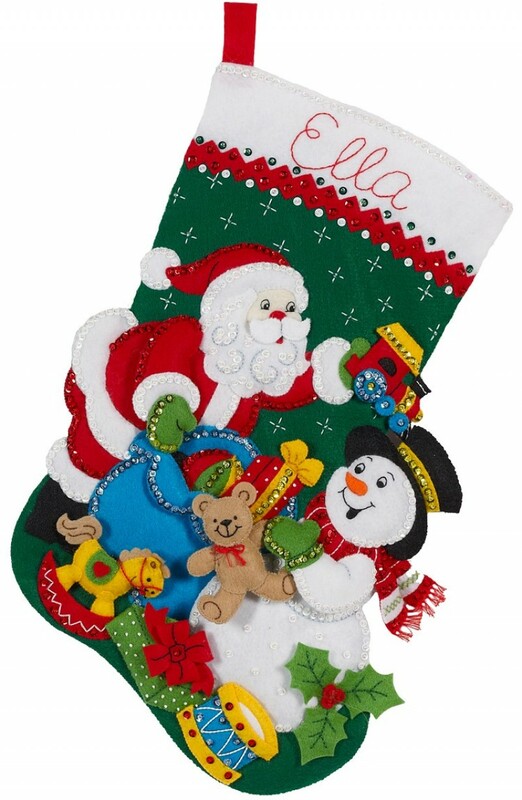 He has several toys sprinkled on the floor as he holds a stocking in one hand and his sack of toys in the other hand. Santa still has to fill b the stocking and put them back on the mantle with care before he moves on to his next stop. 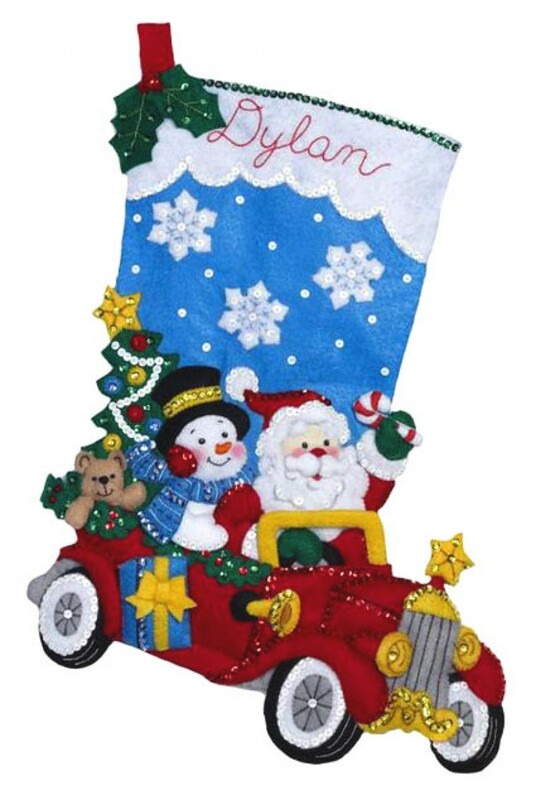 "CHRISTMAS DRIVE " - $135.00 -Santa is out for a drive in a vintage red and green truck packed full of toys and a large Christmas tree. He must have picked up a mail delivery truck or found one during his travels through England or one of the other countries that has the steering wheel on the right . A snow capped hill with a Snowman in the background. 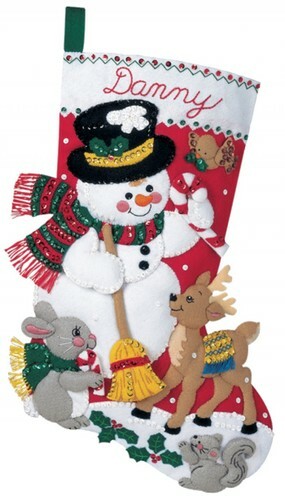 "SNOWMAN AND FRIENDS " - $135.00 - A vintage design featuring a snowman and his forest friends, including a deer, rabbit, squirrel, and bird. 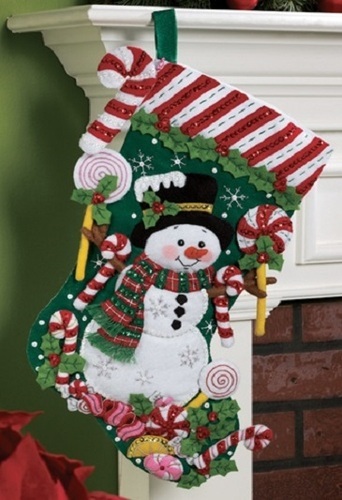 "CANDY SNOWMAN" - $140.00 - Colorful Snowman with his top hat, beautiful scarf and surrounded with candy canes, loli pops, candy pieces and holly. The name goes on the back of the large Candy Cane that hangs. 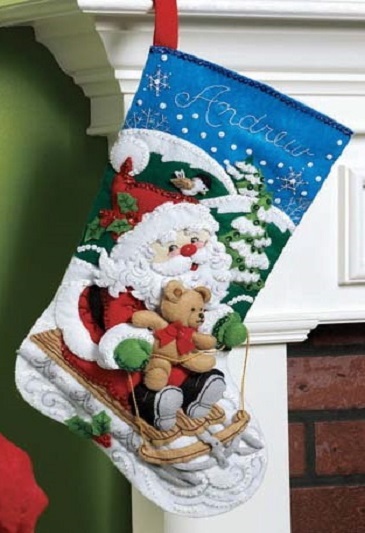 "ARTIC SANTA" - $140.00 - Santa has changed his traditional red suit to a beautiful blue suit to make a special trip to visit this Polar bear family in the Artic. 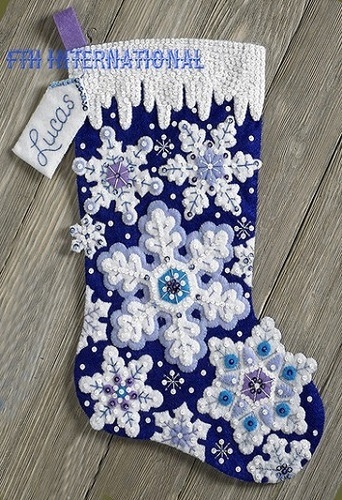 Dark blue, and lilac/mauve colors blend in beautifully. "UNDER THE TREE " - $135.00 - A beautifully decorated Christmas tree with a toy soldier, teddy bear, drum, and gifts underneath. 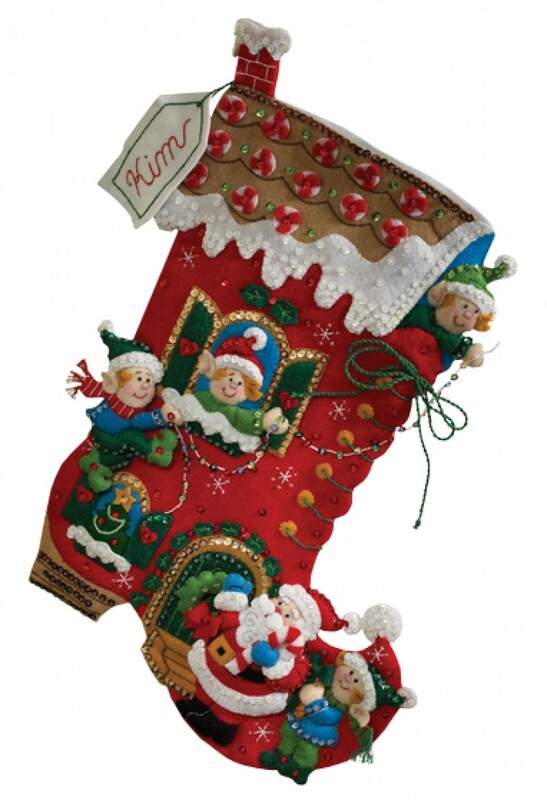 "HOLIDAY DECORATING" - $140.00 - Santa and some of his jolly elves is beautifully decorating one of Mrs. Claus boots with holly, lights and a wreath. The roof is covered with starlight candy and snow. "GOLFING SANTA" - $150.00 - Santa is dressed in his golf outfit as he tries to sink a short putt. His raindeer caddy holds his bag and looks on while a little penquin hold up the Candy Cane that is the hole flag. 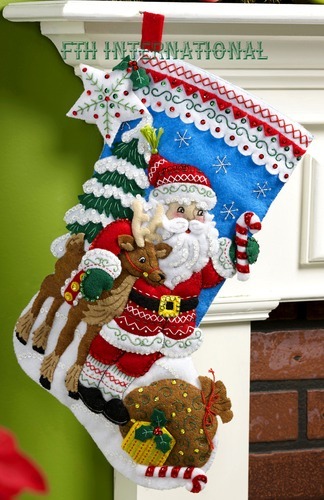 "HO HO HO" - $145.00 - Santa is overloaded with beautifully decorated gifts and is dangling a stocking with candy cane as well. 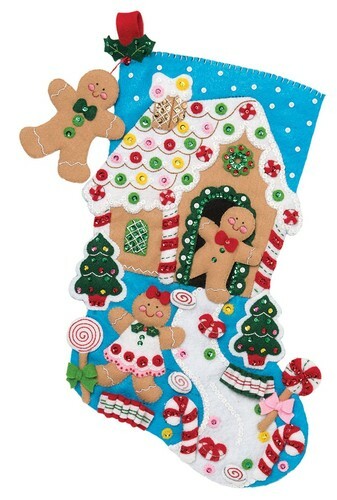 A big Ho Ho Ho to bring happy thoughts of Christmas cheer. 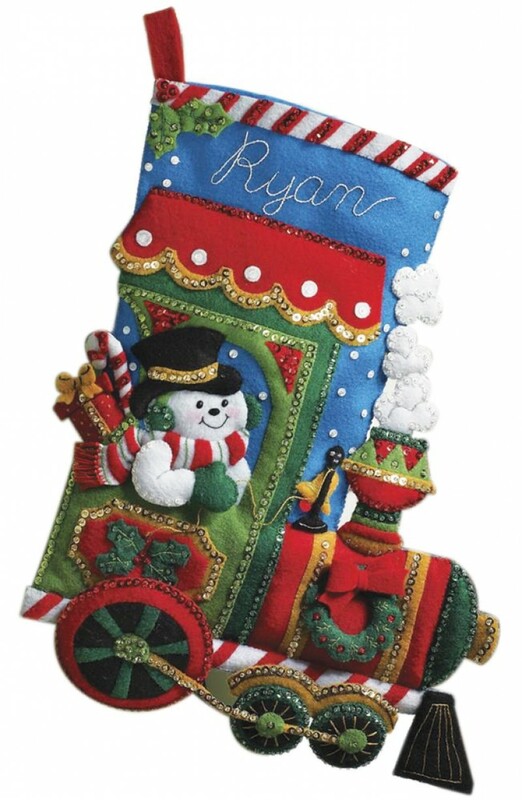 "CANDY EXPRESS" - $135.00 - The stocking is part of the train. There is so much detail, the white smoke pouring out, the holly wreath hanging from the engine and the snowman engineer. 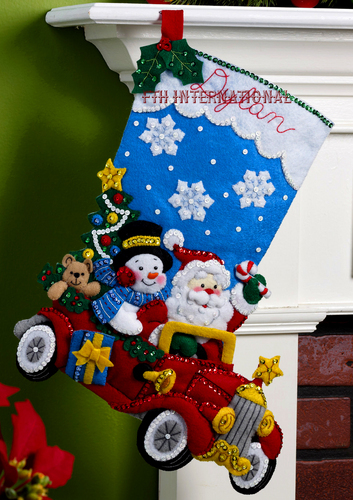 "SANTA'S SLED" - $145.00 - Santa is going down the snowy hill with a teddy bear on his lap and a little bird sitting on his head. 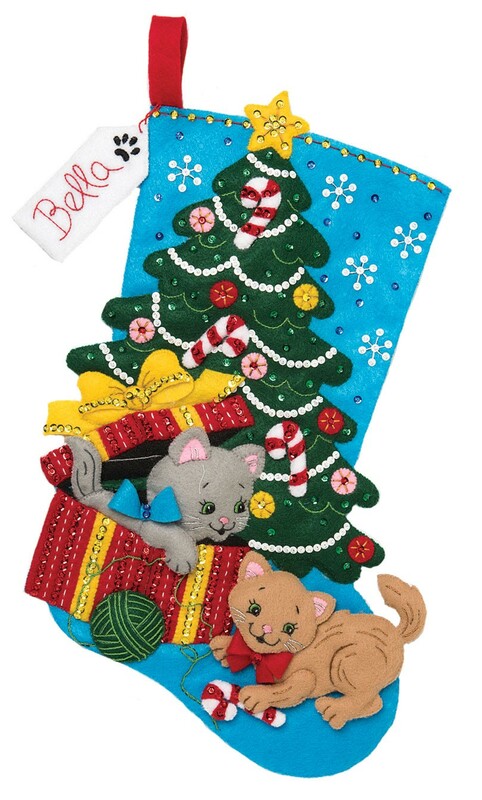 In the background is the beautiful blue sky and snow covered trees. 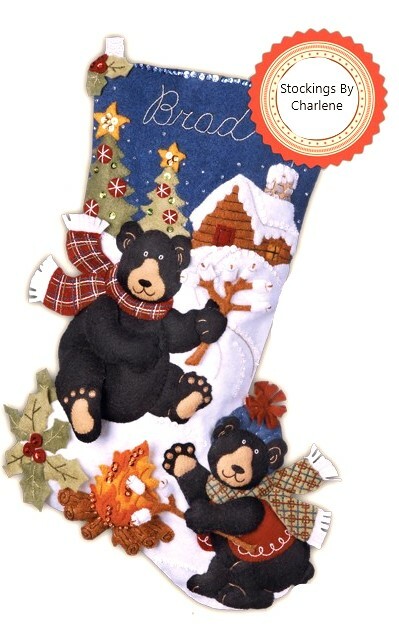 "BLACK BEAR BONFIRE" - $135.00 - This stocking features two lovable bears roasting marshmallows by a warm fire. 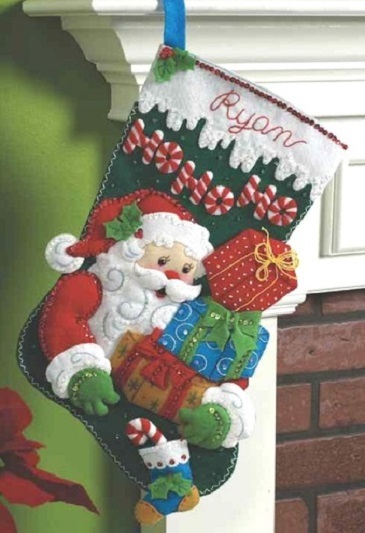 "SANTA AND SNOWMAN" - $135.00 - A jolly Santa and his snowman friend pack Santa's bag full of toys. 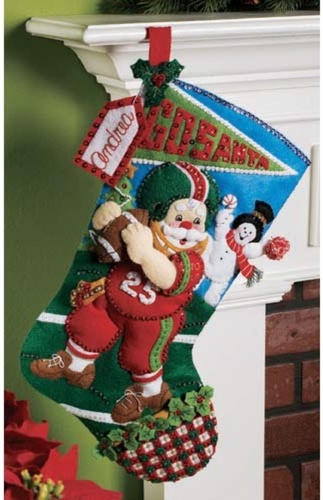 "FOOTBALL SANTA" - $140.00 - Santa is looking pretty spiffy and id gettig et to score as Frosty cheers him on "GO SANTA" from the sidelines. 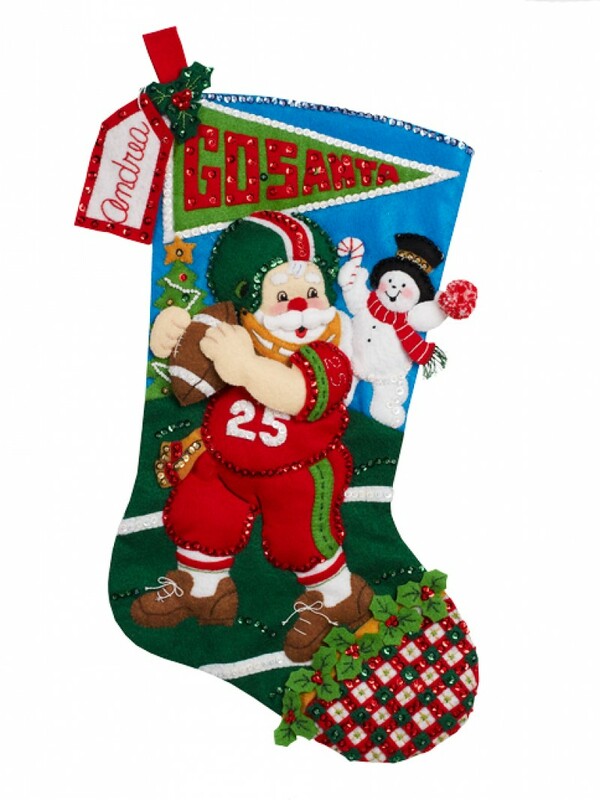 Score a touchdown and get this for the football fan in your family. "THE PAWFECT GIFT " - $135.00 - For the cat lover in your life. 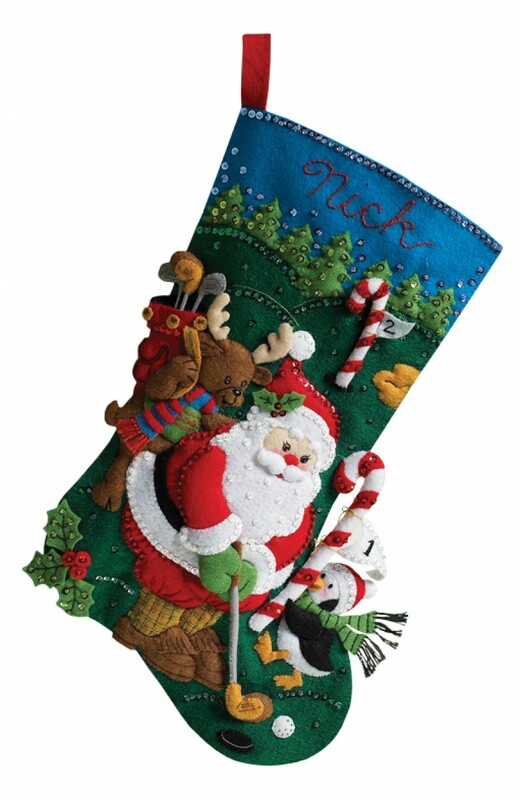 "SPORTS SANTA" - $150.00 - This stocking features Santa surrounded by balls, racquets, clubs, gloves, skates, skis, and a helmet. 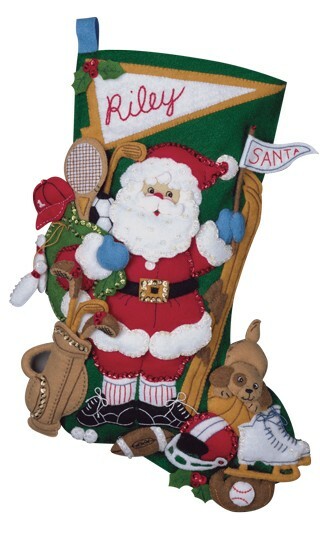 A perfect stocking for the athlete in your family. 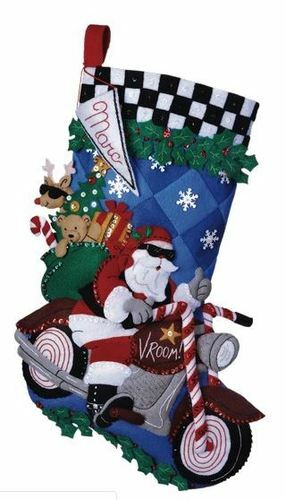 "CRUISING SANTA" - $150.00 - Designed for the biker in your family. 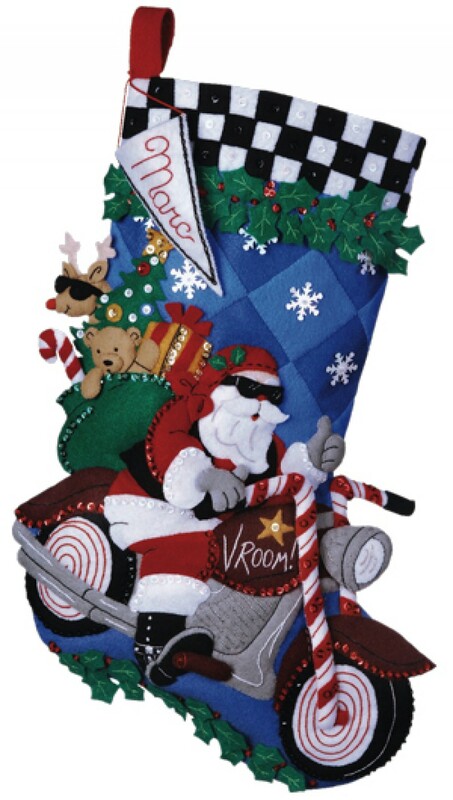 If you�re looking for the perfect stocking for a Harley Davidson lover, this is the one. 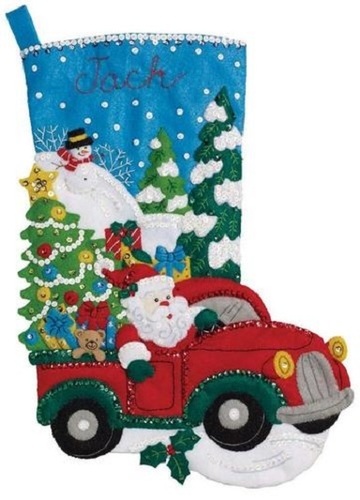 "HOLIDAY DRIVE " - $135.00 - Santa has his vintage car packed full of presents and even a decorated Christmas tree, as he and Frosty appear to be driving out to make Christmas special for some boys and girls. 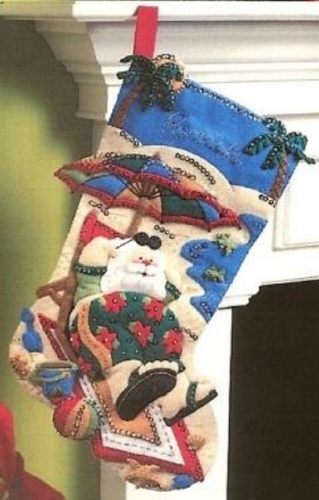 "COOLIN IT" - $135.00 - Santa with his poinsettia decorated swim suit & designer sun glasses, relaxing under the palm tree & beautiful umbrella in his lounge chair listening to the waves. Beautiful sea shells all around. 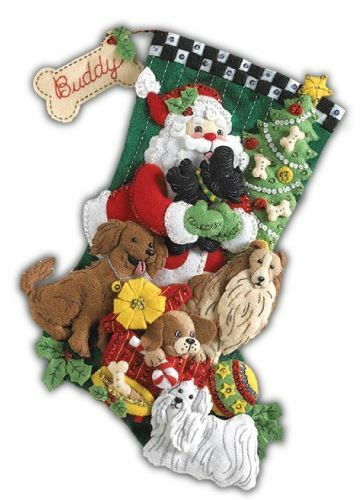 "SANTA PAWS" - $150.00 - For all those dog lovers out there, featuring all sorts of furry friends, is perfect for you. 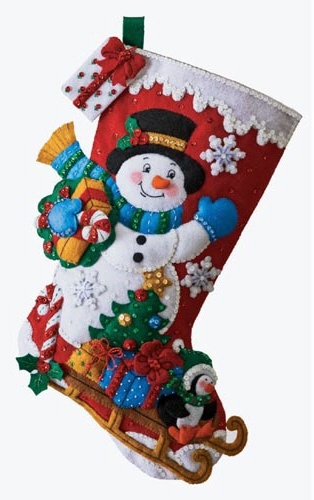 "SNOWFLAKE SNOWMAN" - $140.00 - Winter blues and whites. 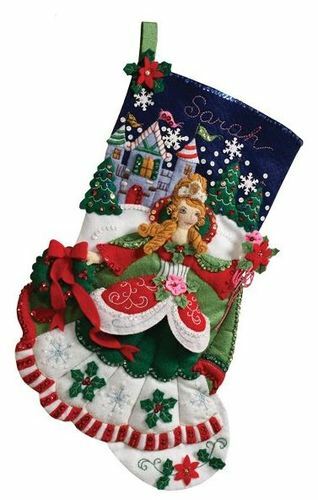 "PRINCESS" - $140.00 - A grand winter princess graces this stocking, her candy cane castle in the background. Perfect for the princess in your family! 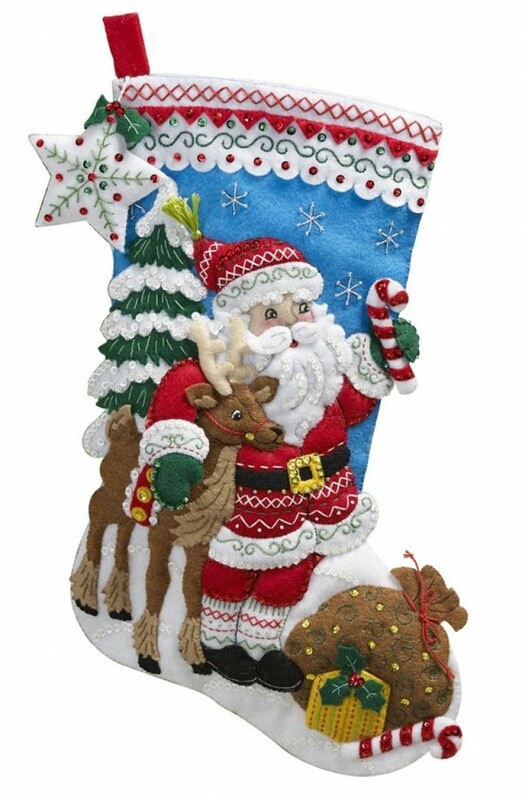 "NORDIC SANTA " - $140.00 - The European themed Nordic Santa takes a moment to give his raindeer pal a well deserved hug. 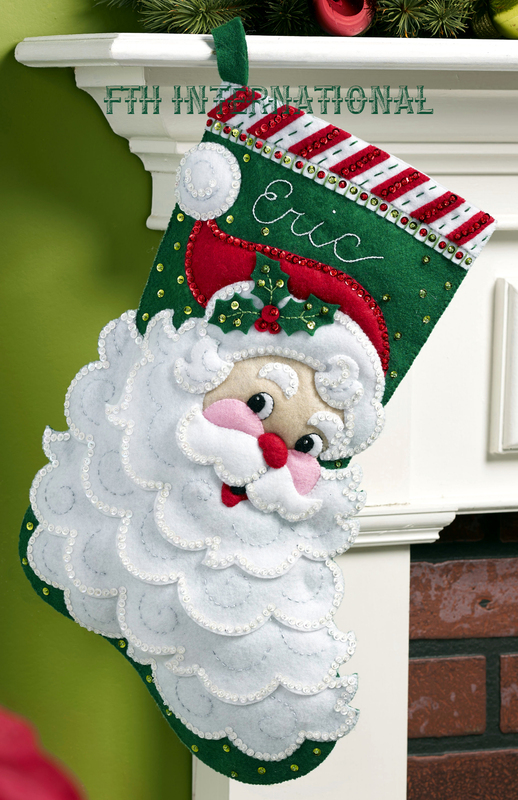 The red and white colors and decorative stitching used through Santa's red suit from the top of his hat all the way down to his white socks. 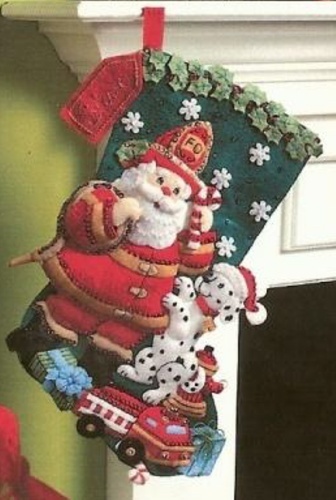 "FIREMAN SANTA" - $150.00 - Santa is dressed up in his Fireman's regulation garb, holding a fire hose with his perky Dalmation in a Santa hat, with the fire hydrant, big red toy fire truck and presents. 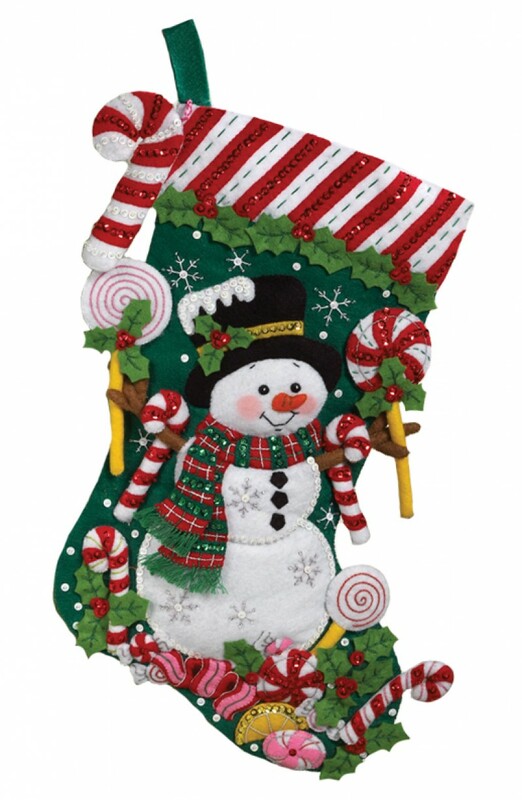 "SNOWMAN WITH PRESENTS" - $135.00 - Frosty and the little Penguin are helping Santa with deliveries as he has a lot of people on his Christmas list. 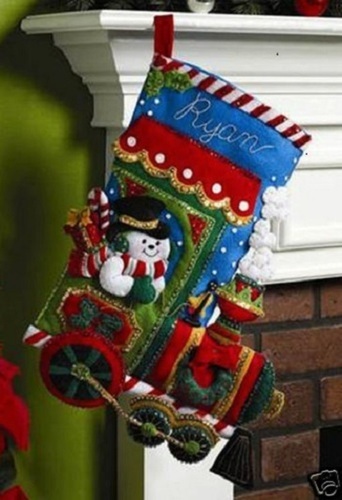 His arms and sleigh are both packed with colorfully wrapped gifts. 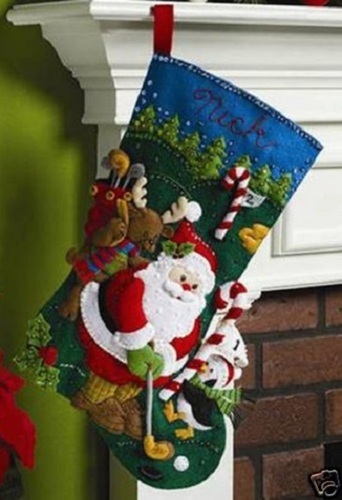 "JOLLY ST. NICK " - $135.00 - What could be better than to wake up on Christmas morning to be greeted by this Jolly St Nick smiling at you with a stocking full of goodies. 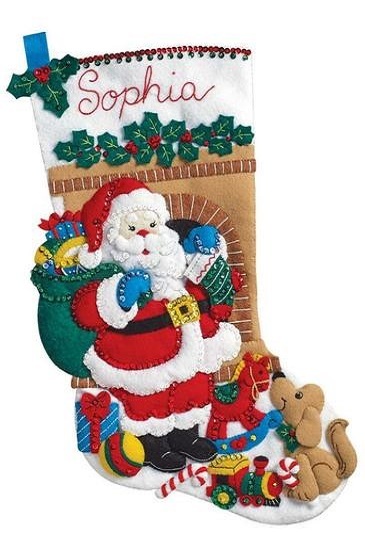 This stocking would suit all ages from toddlers to seniors. 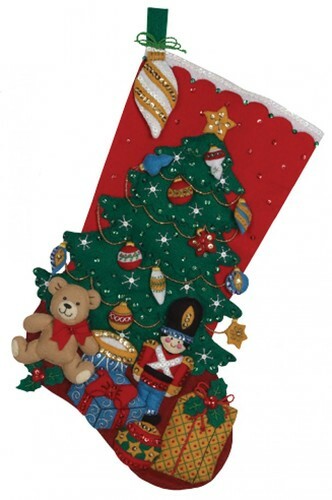 "SANTA NUTCRACKER" - $140.00 -AVAILABLE LATE SPRING 2019 - This stocking is both timeless and beautiful. 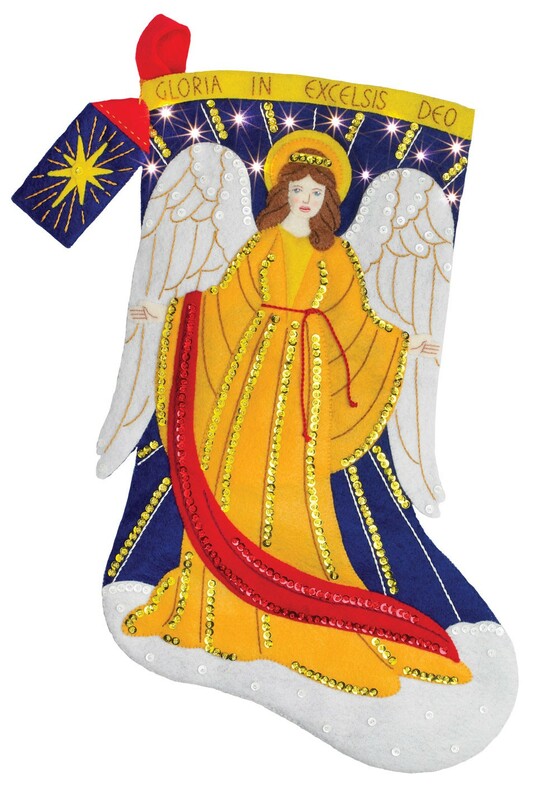 "HEAVENLY MESSENGER" - $140.00 - AVAILABLE LATE SPRING 2019 Features lights in the design.